While the disparate output of the Los Angeles School of Black Filmmakers, or the L.A. Rebellion, has never seen more critical recognition than in present day, mainstream coverage still leaves much to be discovered. The movement, spanning a 25-year period (1968-1993), was borne of a diversity initiative by the UCLA Film and Television Program, giving Black and other students of colour the opportunity to learn filmmaking and create films, many of which prioritized experimental aesthetics. [i] Alile Sharon Larkin’s The Kitchen (1975), emerging from the particularly limit-pushing Project One series, is one demonstrably discursive specimen. Situated within a body of student work that explicitly examines feminist themes, the seven-minute film chronicles a non-linear narrative of an institutionalized Black woman who has internalized Eurocentric beauty standards. Shot on 8 mm black-and-white film, The Kitchen demonstrates the power of utilizing experimental formal aesthetics to convey a Black woman’s psyche under duress from the pressure and effects of anti-Black racism. The Kitchen demonstrates the power of utilizing experimental formal aesthetics to convey a Black woman’s psyche under duress from the pressure and effects of anti-Black racism. 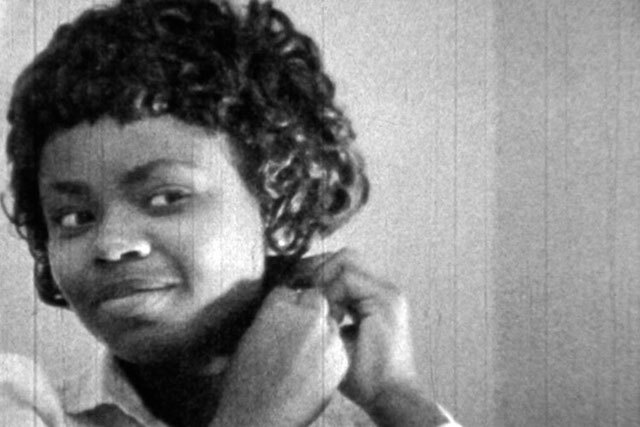 The Kitchen opens with the image of a Black young woman in a white straitjacket being led down a narrow hallway by two hospital orderlies. 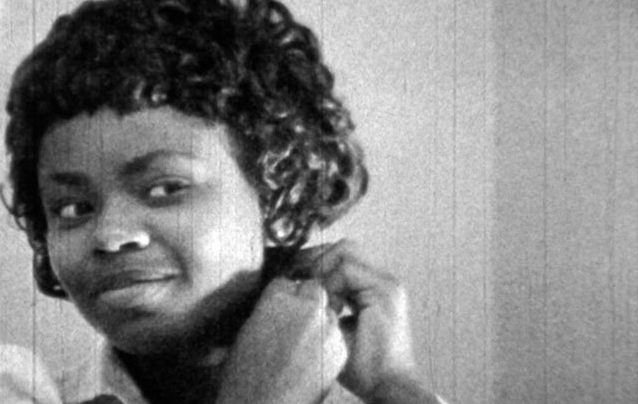 Mere moments after this sombre opening, the film quickly jumps in flashback to a scene where the young woman, unnamed in the film, examines her reflection in a mirror and tugs at her short natural afro in frustration before slipping on a short black wig with looser, sleeker curls and smiling. Visual disconnect through flashback becomes a recurrent feature as the film continues to shift between scenes of the woman’s current confinement and the actions that led her there. We discover that our protagonist is a domestic worker through another sharp cut to a scene at her white employer’s home where she is ironing shirts while her employer brushes her daughter’s hair. The young woman becomes distracted by the scene and she begins to daydream, seemingly coveting her employer’s long, straight, fair hair. In her absentminded reverie, she burns the garment she is ironing; the smell of burning is what signals to the employer – and the audience – that something is amiss. Even as she is scolded and shaken out of her delusional state, the young woman blankly runs her fingers through her employer’s straight locks. Following this scene is a haunting moment where the protagonist sees her own daughter approach her from a distance, envisioning the girl sporting a prim dress and loose curls, fitting the standards of white femininity. When the visual fantasy fades away, her daughter remains, donning her natural hair and her “outside play” clothes instead. The protagonist is visibly disgusted with reality, forcibly yanking her daughter out of the frame by her hair. While the delusion is communicated with meandering shots and distant gazes, the physical manifestation of this self-hatred is presented at the film’s conclusion with stark realism when the woman purposely burns her daughter’s head with a pressing comb in what can be read as punishment for not possessing the “finer” features coveted earlier. The lack of dialogue and plot conventions, in addition to the choppy editing between present and flashback scenes, disrupt the filmic techniques of a more conventional linear tale. Larkin’s editing and framing skills purposefully point to a fissure in the consciousness of the young woman. Continuity editing is a filmic technique that enables the audience to organize their attention and to direct their understanding of the film’s narrative. [ii] By utilizing non-linear style in addition to a truncated length, the film does not adhere to the continuity editing practices featured in dominant cinematic narratives. Larkin’s audience is left in a state of disarray, the disorganized narrative mimicking the protagonist’s erratic state of mind. The introductory footage where the young woman is escorted down the hallway is also seemingly slowed down, producing psychic disorientation. The affective response of disorganization is crucial as it unsettles the viewer’s sense of time and their relationship to the film. The Kitchen’s editing impresses upon the viewer, shaping how the audience interprets the protagonist’s sense of her ‘self’ and body in the world. Fanon’s conception draws attention to how forming an impression of the cinematic image depends on how cinema actually impresses upon us, effecting our feelings. Scholar Sara Ahmed’s writing on emotion animates the concept further; making a connection between the tactile sensory and the emotive, she notes the association of “the experience of having an emotion with the very affect of one surface upon another [leaving] its mark or trace.”[iv] The Kitchen’s editing impresses upon the viewer, shaping how the audience interprets the protagonist’s sense of her ‘self’ and body in the world. Colour, too, contributes to this effect, with Larkin’s use of black-and-white or a garish monochrome purple wash proving unsettling. While the audience may get a “feel” of the protagonist’s self-hatred, the formal aesthetics signify that something is amiss with our lead and dissuade us from identifying or “agreeing” with the protagonist’s sense of self. The Kitchen reveals how cinema is not a disembodied experience, but one whose meaning and feelings are mediated and informed by the body. In communicating embodiment, Larkin places distinct focus on the protagonist’s hair. Throughout North American history, Black women’s hair and hair styles have been policed, fetishized, mocked, and often only rendered acceptable when not attached to Black women’s bodies. Throughout North American history, Black women’s hair and hair styles have been policed, fetishized, mocked, and often only rendered acceptable when not attached to Black women’s bodies. Given this extensive archive of embodied existence, it is no wonder that our protagonist’s self-worth is informed by her relationship with her hair. The eponymous“kitchen” itself doubles as a colloquial expression for describing the edges of Black hair at the nape, often kinkier and curlier than the rest of one’s hair. Afro-Cuban philosopher Sylvia Wynter writes about this self-criticality specific to Black personhood, detailing how colonialism creates a process of autophobia within Black individuals as they are made to hate themselves, and their bodies especially, to align themselves with dominant power structures in society. [v] Following her line of inquiry, Wynter digs further, asking how Black folks can possibly extricate themselves from this dynamic if, indeed, this “Black/white psycho-existential complex” and its attendant anti-Black racism and Black autophobia are constructed and reproduced, rather than facts of our being. [vi] Wynter’s theorizing signifies that Black abasement and self-hatred are so rampant that they are normalized in society. This is what makes The Kitchen so unique: it does not code self-hatred as normalized behaviour, but rather presents it as problem of Black consciousness that needs to be addressed through non-normalized aesthetics. In this way, the film – while being about self-hatred and Blackness – resists the ritualistic demonstration of engaging with the confession and representation of Black self-hatred without an affirmation of and for Blackness. [vii] By painting this internalization as a problem, Larkin’s film begins to chip away at the alienation of the Black body through film’s ability to convey embodied senses and forms of affect, like shame. In its seven minutes, The Kitchen makes no attempt to solve, or resolve, the problem of its protagonist, but instead successfully draws attention to Eurocentric beauty standards and the value placed on them in society. Keeping in line with the predicament of non-resolution, the film features a dissatisfying summation, leaving the audience to reflect on the young woman’s concluding state: alone, thrashing about in a white cell. Ayanna Dozier is a Ph.D. Art History and Communication Studies Candidate with a graduate option in Women and Gender Studies at McGill University. She is cultural theorist who writes extensively about Black feminist philosophy, experimental cinema and performance art. 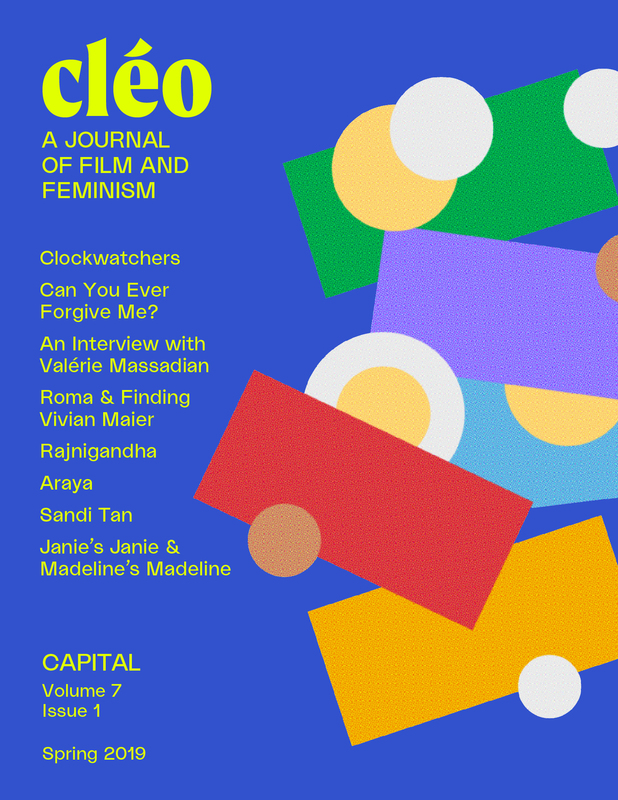 Selected writings can be found in cléo, Feminist Media Studies, Art/iculation Magazine and Liquid Blackness Journal. Ayanna Dozier is a Ph.D. student in the department of Art History and Communication Studies and the Institute for Gender, Sexuality and Feminist Studies at McGill University. [i] Alyson Field, “Rebellious Unlearning: UCLA Project One Films (1967-78)” in L.A. Rebellion: Creating a New Black Cinema, eds. Allyson Field, Jan-Christopher Horak, and Jacqueline Stewart, 83-118 (Oakland: University of California Press, 2016), 104. [ii] Kara Keeling, The Witch’s Flight: The Cinematic, the Black Femme, and the Image of Common Sense (Durham: Duke University Press, 2007), 56. [iii] Frantz Fanon, Black Skin, White Masks, translated by Richard Philcox (New York: Grove Press, 2008), 131. [iv] Sara Ahmed, The Cultural Politics of Emotion, 2nd edition (New York; London: Routledge, 2014), 6. [v] Sylvia Wynter, “Towards the Sociogenic Principle: Fanon, Identity, the Puzzle of Conscious Experience, and What it is Like to be Black,” in National Identities and Sociopolitical Changes in Latin America, eds. Mercedes F. Durán and Antonio Gómez-Moriana, 30-66 (New York: Routledge, 2002), 57. [vii] bell hooks, Black Looks: Race and Representation, 2nd edition (New York: Routledge, 2015), 10.